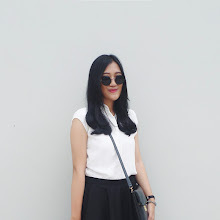 Kadya Kirana: What I Wear: Statement Stockings! What I Wear: Statement Stockings! All those instagirls gotta love this new hot item: fishnet stockings! I mean who doesn't? The pair will give you an ultimate edgy look without being too much. Here's my take on pairing the fishnet stockings and wearing them for my daily outfit! (With a little help from Pinterest, the source of outfit ideas). Some people might wear them with ripped jeans, but I'd prefer layer it with wide pants; could be culotte, wide-leg, flare pants, anything to still keep the basic-classic look. A t-shirt and denim jacket would be perfect to pair with the culotte! - And don't forget to pair your fishnet stockings with sneakers, boots, or heels for a classy look. So now, no worries about wearing your statement stockings for your daily wear. Have a good day and see you in my next post, loves!